Download a PDF copy of the program, complete with abstracts for each presentation. Much like a regular academic poster presentation, this category will involve creating a 20x36 inch poster to hang on your stateroom door. Content should be made presented in a manner that is accessible to the average individual. You may also wish to provide hand outs or pamphlets that people can take with them. For instructions on making your poster and to download optional poster templates, please click here. You can also view the posters online by clicking here. This category of presentation is identical to the one above, but is intended for individuals not able to physically attend the cruise! You can submit your abstract for a poster presentation and if accepted, you will be asked to print and mail your poster to the conference organizers, who will then arrange to have your poster presented for the duration of the cruise. You can include your contact information on the poster in the event that viewers have questions and would like to get in touch with you. Similar to a poster presentation, only presented orally. If selected for an oral presentation, you may still hang a poster version on your stateroom door to increase the number of people who benefit from learning about your work. Oral presentations will be grouped together by topic and presented in 1 hour segments. You'll have 10-15 minutes to speak and 5 minutes for questions. If you wish for your talk to be included in a CME/CNE session, please include relevant learning objectives. You will have the entire one hour time slot to present your research or workshop. Please include with your abstract the relevant learning objectives that your talk / workshop seeks to achieve. Please submit an abstract detailing the topic of conversation for your proposed roundtable discussion. Discussions will take place during meal times in the main dining room and will be limited to a maximum of 12 people, including the host. After submissions have been made, topics will be posted and conference attendees (and other Ladies of Olivia) can sign up for the lunches/dinners they wish to attend. Please include in your abstract your relevant expertise for leading the discussion and some potential discussion questions that you will use to guide the conversation. Please also indicate the number of people in your presenting group (maximum 3 people). GLMA is accredited by the Accreditation Council for Continuing Medical Education (ACCME) to provide continuing medical education (CME) for physicians. GLMA designates this live activity for a maximum of 8.75 credit hours in Category I of the AMA’s Physician Recognition Award. Physicians should claim only the credit commensurate with the extent of their participation in the activity. GLMA is approved by the California Board of Registered Nursing, Provider Number 16038, to provide nursing continuing education credits. 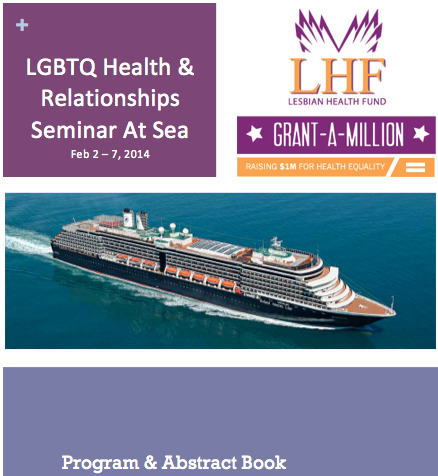 The Seminar at Sea is approved for 8.75 contact hours. For more information on how to receive Continuing Education Credits, please click here.